We may have felt the first few wisps of fall air but as much as I love it, I’m trying to enjoy summer while it lasts. 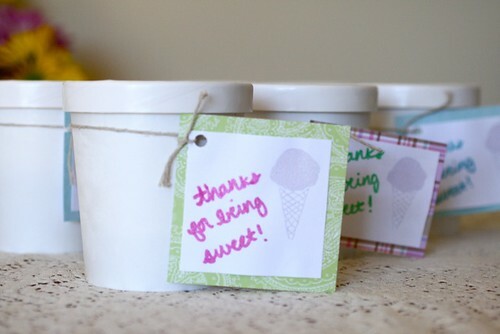 For me, a perfect way to spend part of my Labor Day weekend was hosting an ice cream social party for our friends. Though I’m most definitely one to enjoy ice cream even in the dead of winter, this seemed the perfect end of summer gathering. 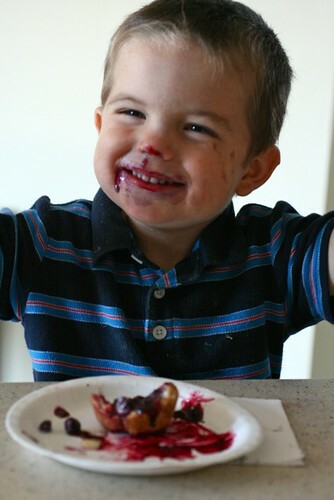 Lots of friends attended and I can say with confidence that this party was a huge hit with adults and kids alike! Also, an awesome added bonus of this party was that in addition to receiving a stipend from Foodbuzz to make it all happen, Foodbuzz partnered with Electrolux made a $250 donation to the Ovarian Cancer Research Fund for mine and each of the other 24 x 24 parties that was hosted this weekend. Not only that, but Electrolux has committed $750,000 to the Ovarian Cancer Research Fund, and Foodbuzz is getting involved not only by sponsoring all the 24 x 24 events, but also by donating a matching amount to the OCRF. Being a physician and seeing cases of ovarian cancer far too often, I was thrilled to be able to host a party and have it benefit a good cause as well. 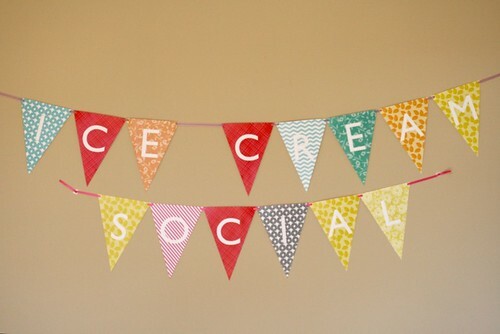 When thinking about this party, I wanted it to be all about ice cream. I thought for a while about serving some other foods to help balance the sweets, but I thought my friends would be able to handle the ice cream extravaganza so I just went with it. 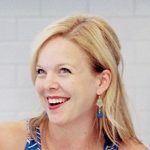 I served each course one at a time so they could be savored individually, and also so we could pace ourselves – we’re talking seven courses of ice cream, after all! 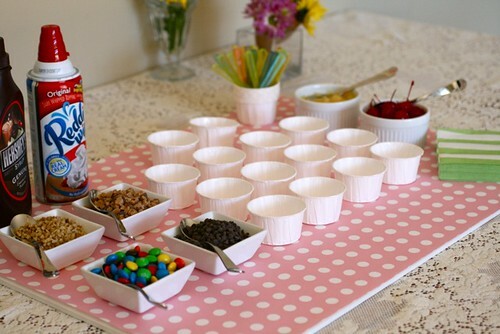 I made sure to keep the serving sizes small so that everyone would have room for sampling all the treats. Milkshakes are such a classic ice cream treat, I just had to include them in the menu. 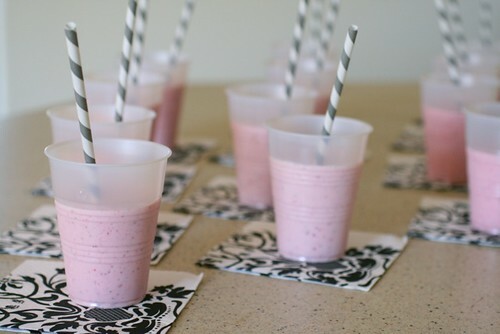 These strawberry milkshakes greeted guests as they came in to the party. I was a little disappointed because I really wanted to serve these in cute shot glasses, but apparently no store in my immediate area sold shot glasses – how weird! Guess I’m just used to growing up in a college town. Thankfully some fun straws and napkins helped with the presentation. The next course was tartufi, or ice cream truffles. Including chocolate ice cream as part of the menu was an absolute must, but I thought this was a fun and unique way to present it. 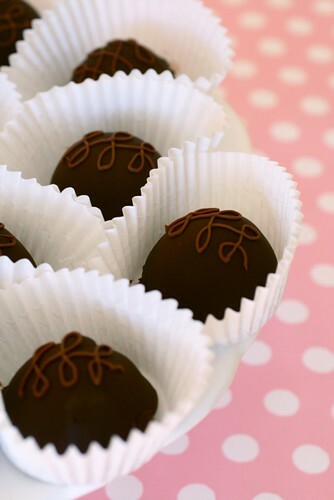 I used chocolate ganache ice cream as the center of these, since ganache is the traditional truffle filling. Everyone at the party seemed to have different favorite treats, but I think I heard the most people say these claimed their top spot. 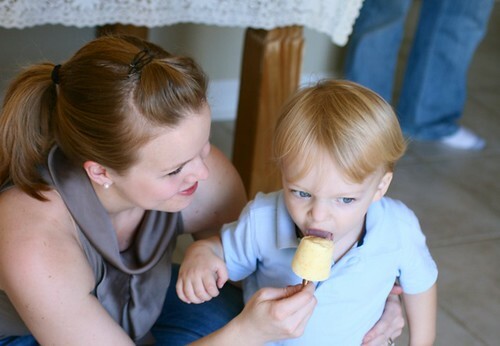 Most people remember the classic orange-vanilla ice cream pops as a childhood favorite. These pops had a flavor reminiscent of the store bought variety, but these are much tastier. 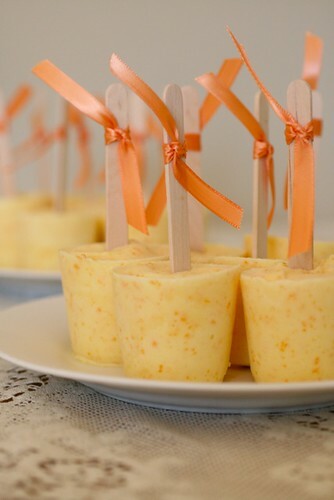 The fresh orange zest and orange juice give these a really bright, refreshing flavor. These were almost like a palate cleanser. 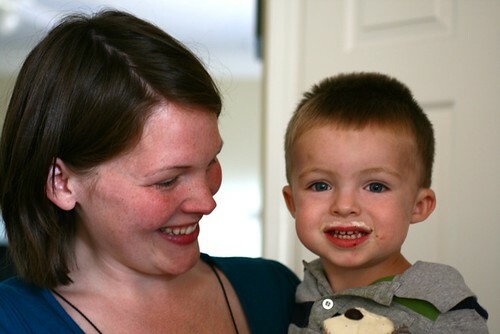 Oh, and they were a big hit with the kiddos, including my little cutie pie. 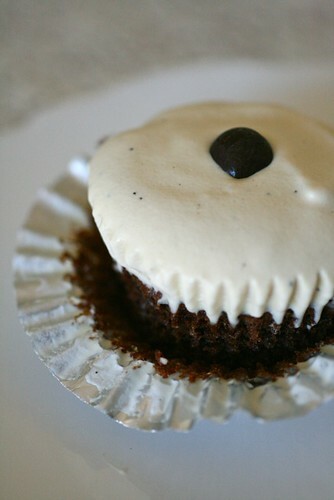 Next up were these brownie coffee ice cream cupcakes. 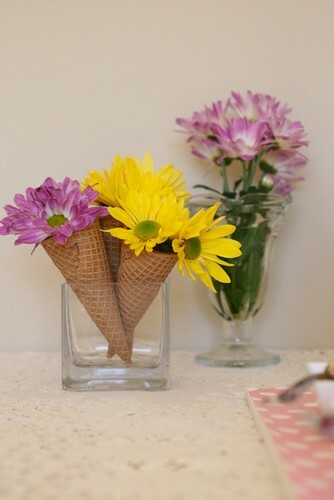 Cake and ice cream are always a winning combination, so ice cream cupcakes are a neat little package of deliciousness. I’ve made ice cream cupcakes before, and it’s fun to play around with the flavor combinations. Since coffee ice cream is my absolute favorite flavor and brownies are awesome (duh), these were a no brainer. I topped each one with a chocolate covered espresso bean for a finishing touch. Some of the kids weren’t excited about these because of the coffee, but Ethan sure seemed to enjoy his! Certainly one of the most common ways to serve ice cream is alongside a slice of pie or a serving of crisp, cobbler, etc. 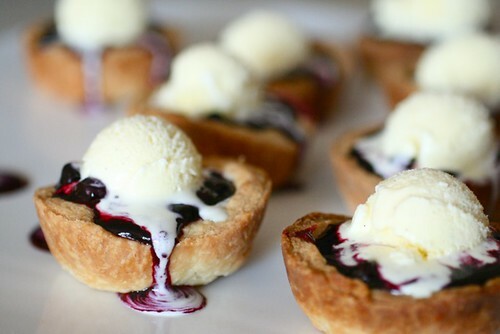 These blueberry pie a la mode cupcakes were my spin on the classic combo to make it mini and portable. Blueberry is my favorite variety of fruit pie, so this was one of my favorite treats of the night. I think Gavin liked it too. 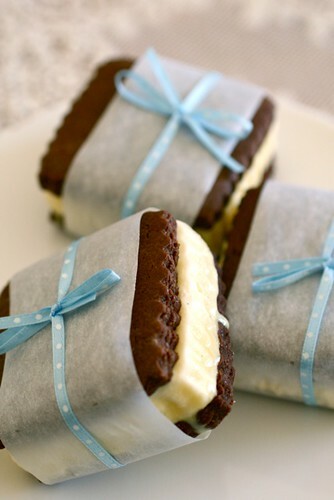 Ice cream sandwiches are a quintessential ice cream treat, so I had to include them. I was thrilled with how they turned out. I’m sure any flavor combo would be great and I will definitely be playing around with many variations, but for this occasion I wanted to stick with the classic chocolate cookie-vanilla ice cream combo. The sundae bar was the last treat of the night. I used roasted banana ice cream as the base for the sundaes, as a fun twist on the usual banana splits. 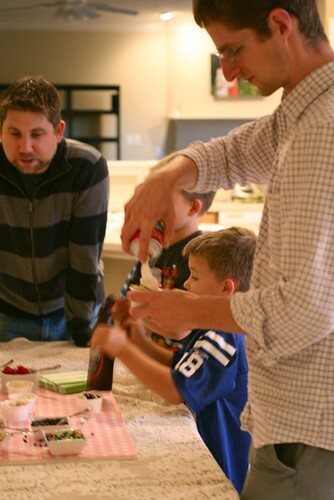 I think this was actually my favorite of all the courses because make-your-own sundae bars are just so fun! It makes me feel like a kid again to see how many toppings I can get on my sundae. The sundae bar was a happenin’ place to be! 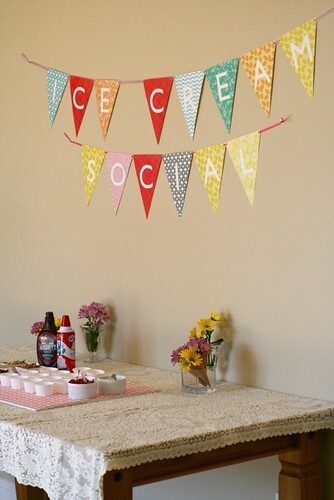 Hope you enjoyed this peek into our party! Recipes will be forthcoming for the strawberry milkshakes, tartufi, orange creamsicles, blueberry pie a la mode cupcakes and ice cream sandwiches.